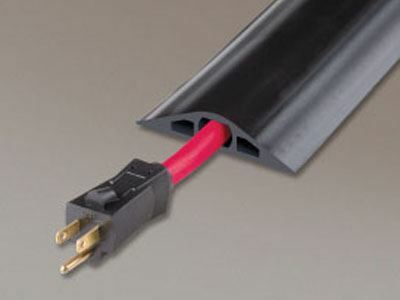 Powerback RFD3 Rubber Duct Protectors are ideal for lightweight vehicles, carts and pedestrian traffic in public, commercial and industrial areas. These three channel protectors are designed with a center channel to protect standard power cords and CAT5 cable located in walkways or work areas. They are non-metallic, flexible rubber protectors that allow you to organize portable cords and cables while reducing trip hazards. Protector is supplied unslit and must be slit to insert standard power cords.